Finding companies that care about my skin, yours and theirs is a mission I’ve turned into an oath. 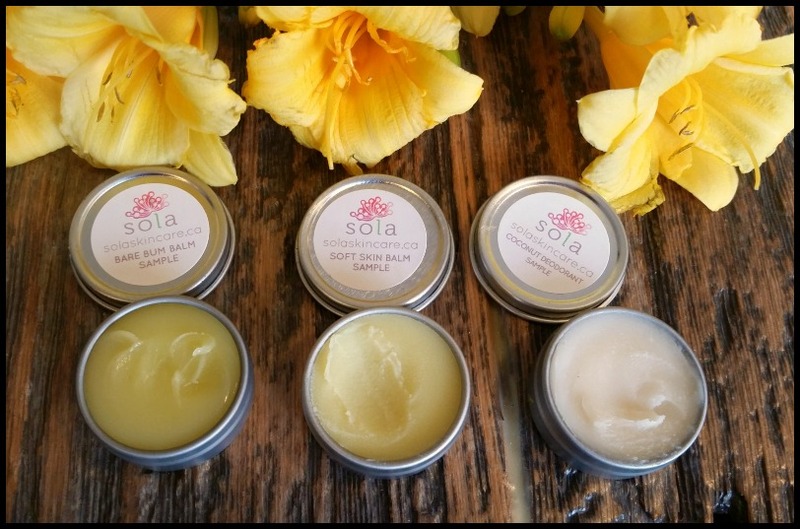 Sola Skincare is the latest Canadian-bred shakers I’m giddy to rave about. 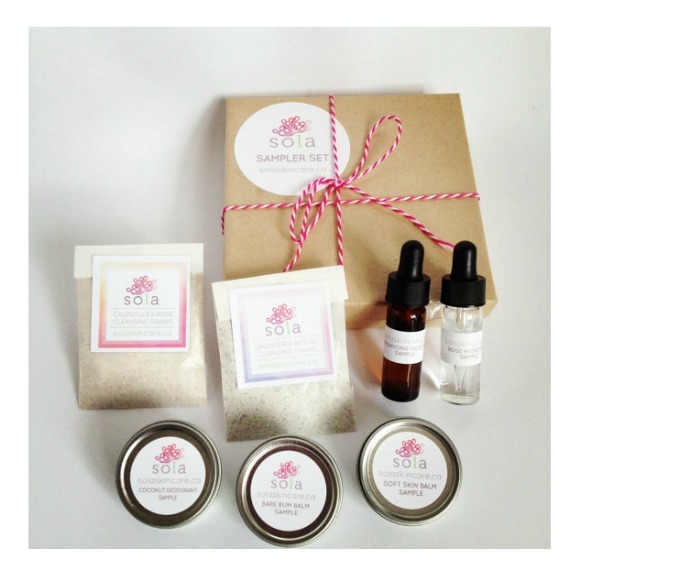 Sola Skincare is made in small batches, with love by a family. Charming, comforting, blended using only natural ingredients. You could probably eat the stuff it’s so pure, but I’m definitely not saying to try that, just making a statement to the effect of the natural purity. I’m like a kid with candy when I get sampler sets- all those skin treats in one place, just enough to taste! It’s nothing short of marketing genius. You try it, you like it, and you buy more… Sephora’s built its entire empire on hoarding out samples, it works and keeps people shopping. Packaged in a quaint, pillow box- I swear these samples smiled back at me. My immediate favorite was the “Soft Skin Balm”. It’s a perfect, rich balm consistency, and worked magic on annoying dry spots, including a rash on my elbow. Sola’s “Coconut Deodorant” may not smell much (only a hint of coconut) but its a prime deodorant for lazy days around the house. It’s no “gym” deo for crazy stinky workouts but its a nice change from harsh deo’s that constantly burn my pits. It’s natural, soft on skin and does the job. 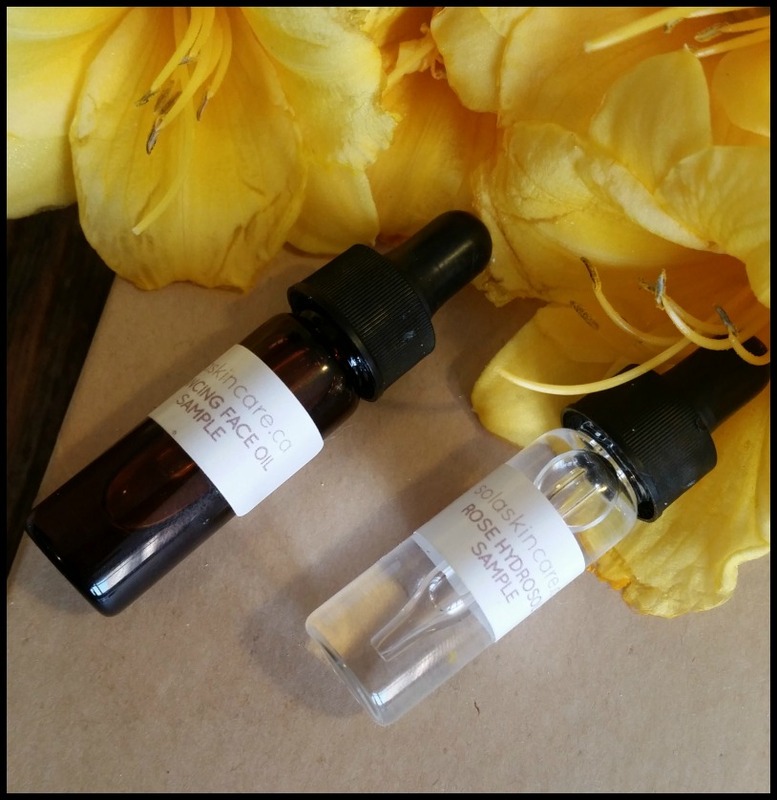 The Balancing Face Oil is packed with more than 4+ carrier-oils (including: argan, tamanu, camelina, jojoba & more…) You can consider all these oils in one little bottle to be mother nature’s version of botox. It’s rich and a real luxury on your face. It could use an essential oil or two to cut the smell of the seedy oils, but I was able to easily add that in myself. 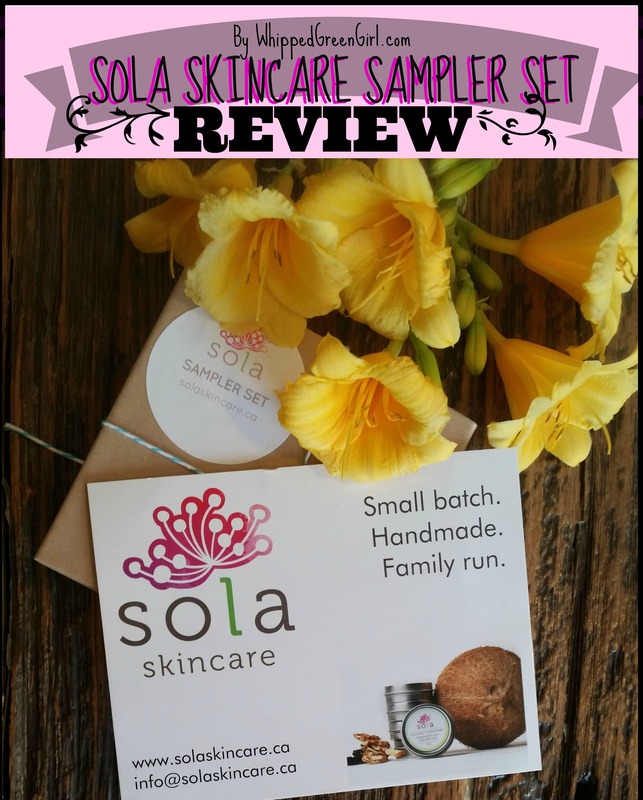 Sola Skincare Sampler Set includes 2 cute “Cleansing Grain” samples mixed using real flowers, grains and plant extracts (Lavender & Adzuki Cleansing Grains – Calendula & Rose Cleansing Grains). They’re super fine in texture, almost like flour… This makes it really smooth and easy to mix and apply (just add water & create a paste…) Exfoliating naturally is the best way to get your skin clean and breathing- Sola’s cleansers definitely did that job and didn’t scratch my face in the least; I loved these cleansers for this! 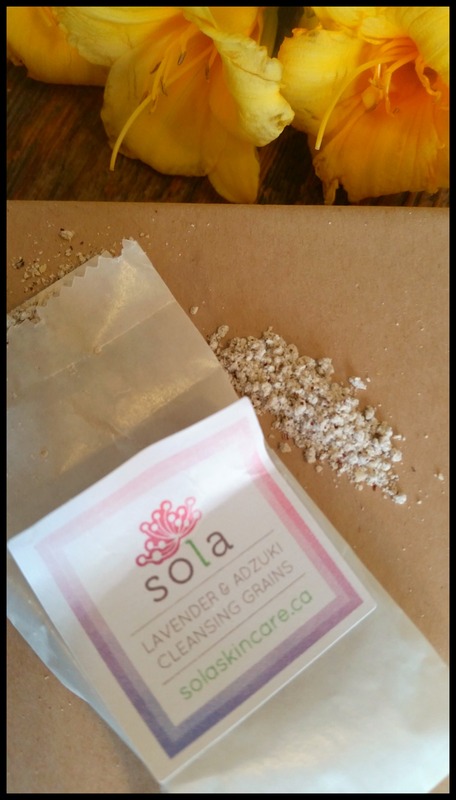 Sola Skincare use simple but creative ingredients- from deodorants and serums, to unique scrubs it takes this kind of edge to stay afloat in the skincare monster marketing wheel. Honest, natural, skincare- it’s not easy to create, it’s not the cheapest route to go, but its why Sola exists. Environmentally conscious, even Sola‘s goods are packaged in recycled/reused supplies- their way to help reduce waste. There’s certainly no regulators for that kind of love, it comes from a place we call home, where their lotions and potions are mixed minding you and your health. I raise my glass to honest companies like Sola, you’ve restored my faith in using skincare lines sold on the market again. Sola Skincare is simple, toxic-free, what mother-nature intended beauty to be!